Save the world with Action Science! 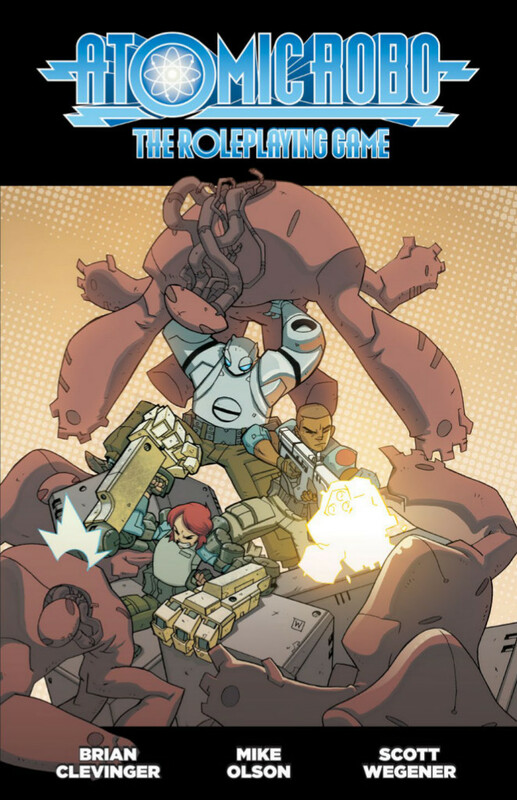 Today, I’m taking a look at the Atomic Robo RPG from the Bundle of Fate +3. This was a difficult one to choose from – I was tempted to go with Baroque Space Opera instead, and Unwritten: Adventures in the Ages of Myst beckoned as well. But I’ve heard some interesting things about Atomic Robo, and so I decided to go with this instead. And by pure coincidence, this turned out to be a fun-house mirror image of Itras By from yesterday. Atomic Robo is based on a series of comic books about the atomic robot, Atomic Robo. Robo was created by Nicola Tesla, and since his creator’s death, he has been in charge of a company building on all the super-science secretly invented by Tesla. And so today, Robo leads a band of Action Scientists going out to battle nefarious conspiracies trying to take over the world. The Atomic Robo roleplaying game is built on the Fate system, with a few special quirks of its own. As in other Fate games, a character consists of a number of skills, some stunts and some aspects. Atomic Robo organises the skills in “Modes”, gathering a set of skills to do with the same type of actions. Each character has three modes at different levels (one Good, one Fair and one Average), choosing from the four Standard Modes (Action, Banter, Science or Intrigue) or creating or adopting a ready-made “Weird Mode”. Weird Modes are skill sets that are tailored to a concept beyond the generic Action Scientist mould of the gamer. Example Weird Modes include Robot, Dinosaur and Reporter (cause reporters are weird, man). Stunts are ways your character can bend the rules of the game. The game recommends building stunts on the fly, and provides a list of sample benefits a stunt can provide, like a bonus to a roll or an exception to a rule. Weird Modes often provide mega-stunts that provide benefits beyond those of a regular stunt, but a mega-stunt also comes with drawbacks to counterbalance. Finally, each character will have five aspects: one concept aspect (like “I am the atomic robot” or “Ape professor”), one aspect for each of the three modes, and finally an “Omega Aspect,” giving the character a direction or a goal. The concept aspect should be created before the game starts, but the other can be created during play. Each aspect gives you one Fate Point that allows you to influence the game. You gain more in different ways, including when you surrender a fight or when your aspects complicate things for you. The GM version of this is the Budget and the Reserve. For each scene, the GM receives a certain budget of points to spend on making lives difficult for our heroes. When an NPC aspect is compelled, the GM gets a point into his “reserve”, to bring to bear in a dramatically appropriate scene. Throughout the book, bits of the comic is used to illustrate aspects of the game. So when explaining the use of Compels, it shows a scene from the comic where Atomic Robo is compelled. This visualises the mechanics, and gives the book a lot of colour and interest. My impression: This is in many ways the opposite of Itras By. 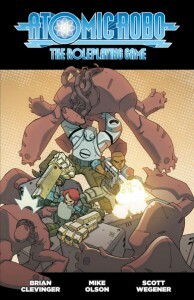 Where Itras By allowed for a wide range of stories and characters, but did not really give enough guidance for how to do so, Atomic Robo gives a lot of guidance and step-by-step instructions on how to use the system, but it seems a bit narrow in the kinds of stories and characters you can play. This may well be because the game is supposed to be a beginner’s introduction to Fate. The game seems tailored to helping both players and game masters get into the game as quickly as possible. For the players, there’s a quick and easy way to build characters that allows you to begin within twenty minutes. Saving the creation of advances, aspects and stunts for during the play allows the players to create mechanical elements for when they need it, and hopefully have a good sense of who each character is, and what they need to work. There is also a more in-depth mode of character generation, for when you want something a bit different. For the GM, there are random “plot generators”, loads of useful advice (both generic and specific to Atomic Robo), plus the financial aspects of the Budget and the Pool. I think this might help inexperienced GMs to understand the game better. On the other hand, I think I might be annoyed at the restrictions inherent in the very mechanical way this is built. The game has a very particular kind of story in mind, and has a couple of neat little sub-systems to assist that. First of all, the Brainstorm. This allows the players to come up with a hypothesis for something in the game – which is then true! It’s potentially a fun tool to putting some Science! into the game, and making players help give the world flavour. All in all, I like the game. In some ways, it feels a little like a modern version of Spirit of the Century, and I think it does a good job of capturing a certain kind of science fiction story. Also, it’s a very easy and accessible version of Fate, and I wouldn’t hesitate to hand this to an inexperienced GM, knowing the budgeting system and the other structures in the game would help them make a good game. Similarly, building characters with modes makes it very easy to create solid characters, without spending hours poring over lists of skills and stunts. Creating things on the fly means I could help players by saying “What do you want to achieve right now”, and then creating an aspect or Stunt in the moment. On the other hand, it lacks some of the charm of something like Spirit of the Century. The more firm structure is also more rigid, and I suspect I might get frustrated with the ways the game wants me to run things. Also, I’m not sure I like the GM budget – while it’s a good way of helping new GMs make a balanced game for the players, I think I prefer fudging things when playing a relatively traditional game like Atomic Robo. How would I use this: I would play Atomic Robo with a group of newbies, to introduce them to Fate, particularly if I ever teach adolescents again. I might also try taking it out for a spin if I ever wanted a one- or two-off game of enjoyable action to play with more adult players. On the other hand, I don’t think this would ever replace Spirit of the Century as my game of choice for silly, pulpy adventure fun.